In January 2015, Gaya was chosen as one of twelve heritage cities to benefit from the Government of India's four-year Heritage City Development and Augmentation Yojana (HRIDAY) scheme for urban planning, economic growth and heritage conservation projects. The scheme is due to complete in November 2018. Gaya Junction railway station is a junction station serving the city. Gaya Junction was the only station in Bihar and Jharkhand in the list of 66 stations to be built to international standards drawn up by Minister of Railways Mamata Banerjee. Gaya falls under the jurisdiction of the Mughalsarai railway division of the East Central Railway zone. The Grand Chord rail line that connects Howrah and New Delhi passes through Gaya. It lies between Mughalsarai Junction on the Delhi side and Dhanbad Junction on the Howrah side. It is located at 24°48′13″N 84°59′57″E﻿ / ﻿24.80361°N 84.99917°E. It has an elevation of 117 metres (384 ft). Situated between Gaya (7 km) and Bodh Gaya (11 km), Gaya Airport is the largest airport by area, and one of two operating international airports in the states of Bihar and Jharkhand. It is the second-busiest airport in Bihar, after Patna's Jay Prakash Narayan Airport. Gaya airport mainly operates seasonal flights for Buddhist pilgrims to Bodh Gaya from Colombo, Sri Lanka; Bangkok, Thailand; Singapore, and Paro, Bhutan. With flights to Jeddah in Saudi Arabia, it also caters to Muslim pilgrims underaking the Hajj to Mecca. There are also regular domestic flights to Varanasi, Kolkata and Delhi. The Airports Authority of India has plans to develop Gaya Airport as a stand-by to the Netaji Subhash Chandra Bose International Airport in Kolkata. ^ a b Lambah, Abha Narain; Dorje, Nangze (2017). "Chapter 13: Challenges of managing a living Buddhist site: Mahabodhi Temple, Bodh Gaya, India". In Wijesuriya, Gamini; Lee, Sujeong. ICCROM-CHA Conservation Forum Series: First ICCROM-CHA International Forum on Conservation Asian Buddhist Heritage: Conserving the Sacred (PDF). ICCROM, International Centre for the Study of the Preservation and Restoration of Cultural Property. pp. 103–111. ISBN 978-92-9077-240-8. Retrieved 27 September 2018. Anugrah Narayan Magadh Medical College and Hospital (ANMMCH) is a medical college and hospital of Gaya, which was established in 1969 and is approved by Medical Council of India (MCI). It is named after Bihar Vibhuti Dr Anugrah Narayan Sinha. Gaya College is an educational institution located in Gaya, Bihar, India. The school was founded in 1944 in the home of Akhauri Prem Narayan.The first President of governing Council was Dr. Anugrah Narain Singh, the first Deputy Chief Minister of the state. It is a constituent of Magadh University at Bodh-Gaya. Gaya College of Engineering is a government engineering college managed by the Department of Science and Technology of Government of Bihar. It is approved and recognised by AICTE and is affiliated to Aryabhatta Knowledge University(AKU) in Patna. It was formerly named 'Magadh Engineering College (MEC)' from 1980 to 1994; now it is a public institute under name 'Gaya College of Engineering (GCE)'. It was inaugurated by the then Chief Minister of Bihar Nitish Kumar on 19 November 2008 in presence of renowned dignitaries and educationists at a function held in college campus itself. Hari Manjhi (born 28 January 1963) is a from Gaya, currently representing that Lok Sabha seat in the Parliament of India. He was also a member of the 15th Lok Sabha. He is a leader of the Bharatiya Janata Party. Acharya Janki Ballabh Shastri (5 February 1916 – 7 April 2011) was an Indian Hindi poet, writer and critic. He declined to accept Padma Shri in 2010 stating his disciples deserved much more than Shri. He also refused the Padmashri in 1994. Lalit Mohan Sharma (12 February 1928 – 3 November 2008) was the 24th Chief Justice of India. He was the son of L.N. Sinha, former Attorney General of India. He served as Chief Justice of India from 18 November 1992 until 11 February 1993. Laxmi Narayan Singh (born 4 November 1955 in Gaya, Bihar) is an Indian politician, university professor, academic, and a member of the Bharatiya Janata Party. Also known as Tun Tun Ji, he was previously associated with the RSS and held various positions in the state BJP organization. He contested the assembly elections in 1995 from Wazirganj (previously known as Gaya Muffassil) as a Bharatiya Janata Party candidate. The Mangla Gauri temple in [Gaya, Bihar] India has been mentioned in Padma Purana, Vayu Purana and Agni Purana and Shri Devi Bhagwat Puraan and Markandey Puraan in other scriptures and tantric works. This temple is among the eighteen maha shaktipeeth. The present temple dates back to 15th century. The shrine is dedicated to Sati or the mother Goddess in the predominantly Vaishnavite pilgrimage center of Gaya. Mangalagauri is worshiped as the Goddess of benevolence. This temple constitutes an Upa-Shakti Peeth — where it is believed that a part of the body of Sati fell according to mythology. Here Sati is worshipped in the form of a breast, a symbol of nourishment. It is believed that whoever comes to Maa durga with his wishes and prayers, returns successfully with all of prayers and wishes come true. The temple is facing east and is built on top of the Mangalagauri hill. A flight of steps and a motorable road lead to it. The sanctum houses the symbol of the Goddess and it has some finely carved ancient relief sculptures. A small hall or mandap stands in front of the temple. The courtyard houses a fire pit for the home. There are two minor shrines dedicated to Shiva and images of Mahishasura Mardini, Durga and Dakshina Kali. The temple complex encompasses of temples of Maa Kali, Lord Ganesha, Lord Hanuman and Lord Shiva. Mirza Ghalib College, Gaya is a Minority College in Gaya offers courses up to Post Graduation in (Arts, Science, Commerce). It was established in year 1969 and affiliated by Magadh University, Bodh Gaya. Rajesh Kumar Manjhi (born 12 April 1968) is a member of the 14th Lok Sabha of India. He represented the Gaya constituency of Bihar and is a member of the Rashtriya Janata Dal (RJD) political party. Satyendra Narayan Sinha (12 July 1917 – 4 September 2006) was an Indian statesman, participant in the Indian independence movement, a leading light of Jaya Prakash Narayan’s ‘complete revolution’ movement during the Emergency and a former Chief Minister of Bihar. Affectionately called Chhote Saheb, he was also a seven-time Member of Parliament from the Aurangabad constituency, a three-term Member of the Bihar Legislative Assembly, and a Member of the Bihar Legislative Council once. Regarded to be one of India's most influential regional people of the time, his reputation was synonymous with being a strict disciplinarian and tough taskmaster. Sir Syed Memorial School is an English-medium school in Bihar, India established in 1992. Sir Syed Memorial School is about 35 km from Gaya, at Karma, near Bhadeya in Barachatti block. It has approximately 1200 students and is run by the Minority Upliftment Society, which aims to provide a good education to children of poor families in rural areas. Tabish Khair (Hindi: ताबिश खैर) is an Indian English author and associate professor in the Department of English, University of Aarhus, Denmark. His books include Babu Fictions (2001), The Bus Stopped (2004), which was shortlisted for the Encore Award (UK) and The Thing About Thugs (2010), which has been shortlisted for a number of prizes, including the DSC Prize for South Asian Literature and the Man Asian Literary Prize. His poem Birds of North Europe won the First Prize in the Sixth The Poetry Society (India) Competition held in 1995. Vikas Kumar (born 18 May in Nalanda, Bihar) is an Indian actor and dialogue coach. Known mainly for his performance of an honest yet adamant cop in YRF TV's Khotey Sikkey, and for his work as dialogue coach in Hindi films like Ishqiya, Zindagi Na Milegi Dobara and Udaan. After a 3-month workshop with theater guru Barry John, Vikas participated in theatrical productions directed by John and later by Aamir Raza Husain and Virat Husain. Since then Vikas has worked as an actor and as dialogue coach. 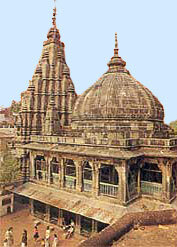 Vishnupada Mandir is an ancient temple in Gaya, India. It is a Hindu temple, dedicated to Lord Vishnu. This temple is located along the Falgu River, marked by a footprint of Lord Vishnu known as Dharmasila, incised into a block of basalt. The Brahma mythy Brahmans were the traditional priest of the temple in the ancient time. Now the Brahamkalpit Brahman who are known as Gayawal Tirth Purohit or Panda are the priests. Several legendary saints as Ramanujacharya, Madhvacharya, Chaitanya Mahaprabhu and Sri Ramakrishna have visited this shrine.